Thanksgiving Baked Carrot Fries - Energetic Juniors - Contact Us! You won’t have any trouble getting kids to eat their veggies when these baked carrot fries are on the table. They’re simple enough to be an everyday side dish, but also are filled with fall flavors, making them a great addition to your Thanksgiving dinner that you can be sure everyone will love. This recipe is especially great for helping encourage picky eaters to expand their palates since it uses cinnamon to bring out the natural sweetness in carrots. Also, naming them “fries” might give them just enough familiarity and up the “fun factor”, getting even your most selective eaters to give them a try. Still having a hard time convincing them? Get kids involved in helping to make the recipe by having them measure the cinnamon, toss the ingredients together, and spread them out on the baking sheet. Once they have a hand in cooking the recipe, they’ll be that much more likely to give it a taste! Wash and peel the carrots. Cut the ends off, then cut each carrot in half crosswise. Then, cut each carrot half in half lengthwise. Finally, cut each half in half lengthwise again to make French fry shaped pieces. In a large bowl, toss the carrots with the coconut oil, cinnamon and salt until evenly coated. 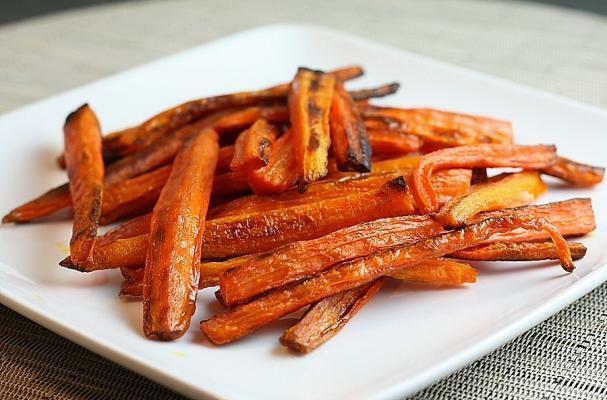 Arrange the carrot fries on a baking sheet in a single layer. Bake for about 20-25 minutes, flipping halfway through cooking time.